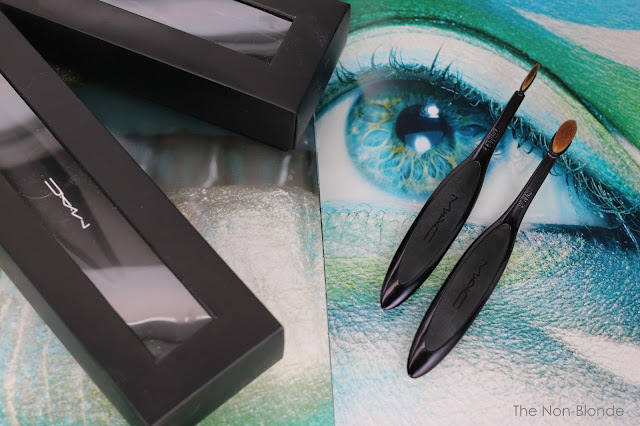 A couple of weeks after posting my review of Artis Oval 8 I ordered these two MAC eye brushes on the advice of a reader. If you recall, as much as I enjoyed the performance of the gigantic Artis face brush I've found it high maintenance and finicky tool that demands its own entourage just to keep it happy. Still, there's something about the concept and the shape that made me want to try more. 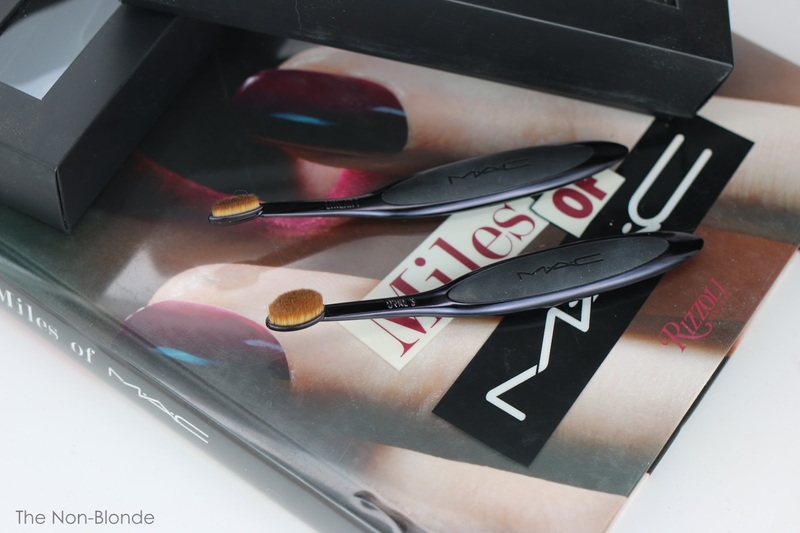 MAC offers a very limited selection of oval brushes. There may have been more of them in the past, but right now all we can get are the Linear 1 and Oval 3 that you see here, as well as the Oval 6 face brush brush, which I'm guessing is smaller than my Artis Oval 8 as it's supposed to be suitable for blush application. In any case, I picked 1 and 3 so I could experiment with new techniques. Linear 1 is supposed to be a mega multitasker: "...delivers a firm, precise stroke to line lashes and lips. Also defines and fills brows.". I've had this brush for the better part of a year now, and have used it for all of the above. I can tell you that there's no chance I'm ever filling my brows with it again. I have all kinds of eyebrow brushes, including the very wide Hakuhodo G524 (and see also this post for more shapes and sizes), and each one of them serves me faithfully. I don't have the steadiest had around, so applying brow powder with such a long and inflexible brush falls under Not A Good Idea. However, the weight and balance of the handle are fantastic, so I don't feel cheated by relegating the Linear 1 to other tasks. It works alright for the lips, though once again my preference is for precision tips that allow me to get a perfect cupid bow and a crisp bottom line. The brush does an excellent job, though, in working color into the lip for evenness and longevity. With that said, MAC Linear 1 now resides with my eye brushes. It's a spectacular tool for the lash line, no matter if you're smudging a pencil, diffusing an eye shadow, applying color to your bottom lashes, or going grunge with a cream eye shadow all around. It takes a some practice to get the handle of it (no pun intended) because you're holding and moving the brush parallel to the skin, which is not necessarily intuitive after three decades of classic brushes, but it's worth the effort. 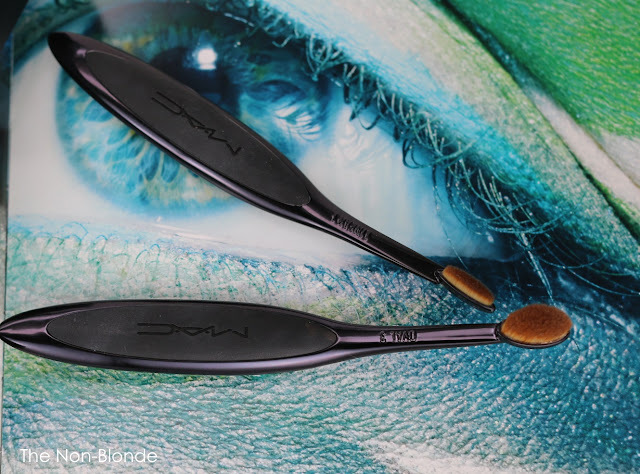 Oval 3 is described as "A brush that smoothly shades and blends shadow, powder and liquid or cream concealer". The flat and dense surface helps product apply evenly at first stroke. The slightly pointy shape is crease-friendly, and the size makes it fit almost everywhere. Here again you need to adjust the way you hold the brush and move it across the lid or elsewhere on the skin. Once you do you'll realize that buffing is easy and quick, as is creating a uniform wash of color. Just as so many regular eye shadow brushes can be used for applying concealer or setting powder to tiny areas, MAC Oval 3 is the same. It's a matter of preference and technique. My favorite use for it is with a cream eye shadow. My go-to has always been MAC 217, but the Oval 3 covers more surface with one swipe and feels softer. I've heard that some makeup artists use this brush in the crease, but here I'm a traditionalist. I prefer a lot of movement in the crease, circular or windshield wiper, and I do that with a soft domed or tapered brush. As usual, your mileage will vary. My biggest complain about the massive Artis brush was cleaning it. It takes me forever to wash all the foundation out of the face brush and several more forevers until this thing dries. Smaller brushes are obviously easier in this regard. Also, I find that gel and cream eye product don't sink into the fibers as much as liquid foundation does, so it's much less of an ordeal. 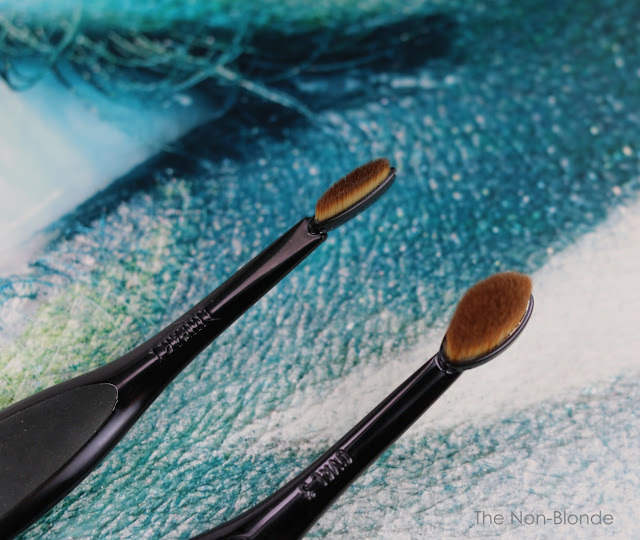 I don't know if it's the nature of the pigments or the fibers used by MAC are much different than Artis's, and the comparison isn't really fair unless we go head to head withe brushes of the same size that have absorbed the exact same foundation. In any case, MAC's oval eye brushes are less fussy than I've feared. 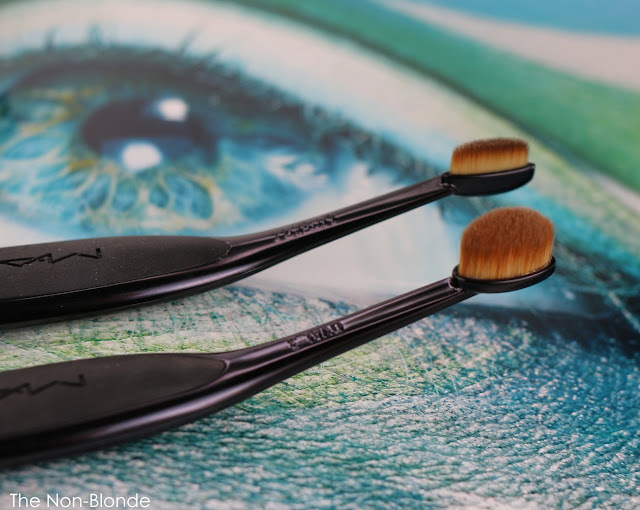 Bottom Line: brush nerds should give it a go. MAC Brushes Linear 1 ($25) and Oval 3 ($32) are made in China and sold exclusively at MAC stores (not department store counters) and maccosmetics.com.